Native Texan and graduate of Texas Tech University School of Law, and Harvard Business School. Quezada is currently an Associate Attorney with a law firm in Dallas, Texas, where he practices corporate immigration and represents some of the largest technology companies in Silicon Valley. 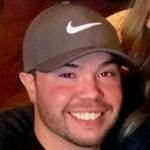 Aside from participating in multiple fantasy football leagues, he is a regular DraftKings DFS player and also wagers on NFL, NCAA, NBA, and PGA Tour events. Beyond sports, Quezada also writes in the arenas of law, politics, and economics.